I'm looking for motivated MSc and PhD students and postdocs with strong C++ or Python skills to work on exciting projects in Geometric and Topological Data Analysis with real-life applications to Materials Science. Please e-mail vitaliy.kurlin(at)gmail.com if you are interested and would like to join the group in Topological Data Analysis. The projects are for students of the University of Liverpool from summer 2019, but can be considered by external interns. Project : Dynamic visualisations of 3-dimensional crystal structures. Description. The aim of this applied research project is to implement a new software tool to visualise the crystal growth in 3 dimensions. A crystal is defined as a collection of different atoms (geometrically, balls of different radii) in a non-rectangular box that is periodically repeated in 3 directions. When the atomic balls grow and start intersecting each other, the volumes of intersections (double, triple and so on) provide important geometric invariants that help to quantify a similarity between crystals. A final visualisation software tool will produce an animation move, say a gif file obtained from a sequence of image files, showing (1) how the atomic balls simultaneously grow and intersect each other, (2) how the volumes of k-fold ball intersections for 1<k<5 change for the variable radius. Project : Distance computations in 3 dimensions with boundary conditions. Description. The aim of this applied research project is to implement a software tool to compute distances between points in any periodic cloud. These points represent centres of atoms or molecules in a non-rectangular box that is periodically repeated in 3 directions. Hence any given point represents a class of infinitely many points in translated copies of boxes. The shortest distance between two different (classes of) points is along a straight line segment that can be within the given box or can cross faces of the box. A final outcome is a programme to correctly compute this shortest distance without boundary conditions. Project : Periodic triangulations and diagrams for 3-dimensional crystals. Description. The aim of this applied research project is to implement a software tool to reliably compute the Delaunay triangulation and Voronoi diagram for any periodic cloud of points. These points represent centres of atoms or molecules in a non-rectangular box that is periodically repeated in 3 directions. For a finite set of centres in 3-space, a Delaunay triangulations consists of tetrahedra (with vertices at given centres) whose circumspheres enclose no given centres. This triangulation is dual to the diagram of Voronoi cells. The Voronoi cell of any given centre is its neighbourhood consisting all points in 3-space that are close to the given centre than to all other centres. All existing software can reliably compute triangulations and diagrams only for finite sets of points, not for periodic sets that model infinite crystal structures. The expected outcome is a well-commented C++ code that can be potentially included into major software libraries widely used in computational geometry/chemistry. Project : An algorithmic classification of 2-periodic links in a thickened torus. Description. The aim of this applied research project is to implement a software tool to automatically classify 2-periodic links. These links model textile structures and knotted strands in materials. Formally, a 2-periodic link is a set of closed curves in a thickened torus, where a 2-dimensional torus is considered as a product of two circles. A projection of a 2-periodic link to the torus gives a diagram with crossings. This torus diagram can be represented by a Gauss code. Past students working on this project have implemented an algorithm that checks whether a given abstract code can be realised by a 2-periodic link. The next step is to start classifying 2-periodic links up to continuous deformations by computing topological invariants of links from realisable Gauss codes. Expected skills for all the projects above. This research direction is suitable for a student who is dreaming about a PhD with a practical impact. The project will require strong programming skills, preferably C++, though Python can be considered. The necessary libraries are OpenCV and CGAL. The selected student will have a desk in the Materials Innovation Factory (MIF). Communication skills will be needed to collaborate with a PhD student working in the same area. The second marker or co-supervisor will be a computational chemist, though no chemistry knowledge is needed for this project. Other relevant skills are linear algebra and computational geometry. How to apply for one of the projects above. External candidates are welcome to follow the advice in the post how to join the research group. For internal candidates (final year and MSc students at the University of Liverpool), the first step is to e-mail Dr Vitaliy Kurlin a CV or a brief description of your past programming projects. The second step will involve solving a couple of exercises depending on your background in mathematics and programming. After that I would be happy to meet for a 15-min discussion. Here is the most recent group photo. The photo below was taken in February 2018. Members from left to right: Naohiko Ban, Asim Munshi, Eris Tricker, Krasen Samardzhiev, Vitaliy Kurlin, Grzegorz Muszynski, Philip Smith. 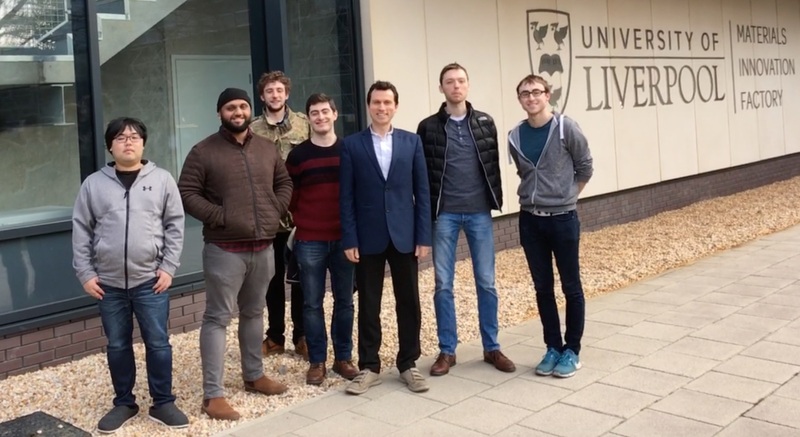 Short-term project students in 2017-18 (various periods from 8 weeks to 8 months): Abid Abdul (2nd year), Alex Bagnall (3rd year), Naohiko Ban (visiting PhD), Jacob Bracken (3rd year), Matthew Bright (MSc), Gemma Cook (MSc), Cameron Hargreaves (MSc), Di Liu (2nd year), Jingyi Lu (3rd year), Asim Munshi (graduate intern), Andrew Parry (3rd year), Antoine Rohmer (2nd year), Arshad Siddiqui (self-funded intern), Eris Tricker (graduate intern), Thomas Welsch (MSc). Summer students in 2017 : Graham Briggs (MSc), Jason Brewer (MSc), Sandra Garcia (MSc), Yuyao Wang (MSc), Zijian Li (MSc), Simon Hirst (EPSRC), Aviral Srivastava (self-funded intern), Falgun Patel (self-funded intern). Mr Christopher Smithers : PhD supervised in 2015-2016 before moving to Liverpool, funded by the Leverhulme Trust. Summer students in 2016 : David Torkington (MSc), Cheng Shen (MSc), Phil Smith (LMS), Aryaman Patel (intern on site). 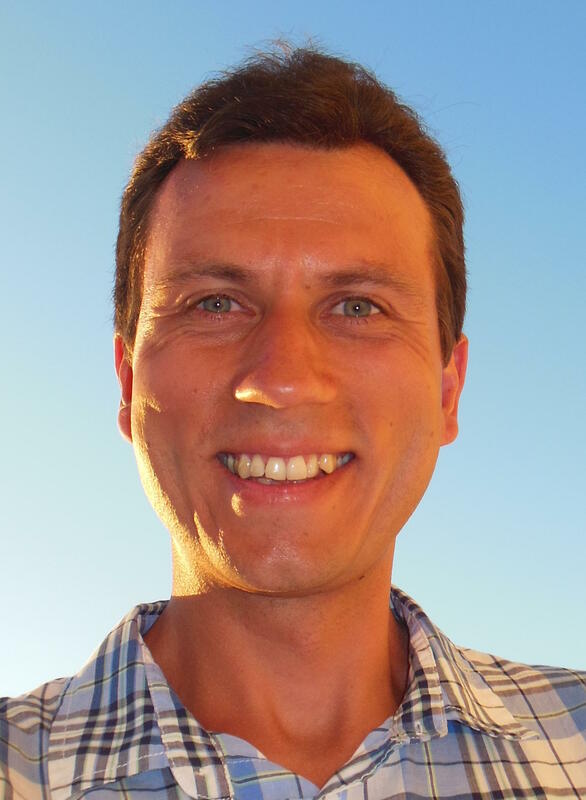 Dr Alexey Chernov : postdoc in 2011 - 2012, now a Senior Lecturer in Statistics at Brighton University, we continue our collaboration on combining Topological Data Analysis with Machine Learning. Dr Marjan Safi-Samghabadi : PhD student in 2009 - 2013, a lecturer at International Imam Khomeini University, Iran. PhD student Ms Marjan Safi-Samghabadi (self-funded) has successfully completed her MSc and PhD in Topological Robotics under my supervision in June 2009 - June 2013. Here is the joint paper based on her PhD. Year 4 student Donald Harvey has completed in 2016 the brilliant project Coarse-to-fine superpixel segmentation with a fast adaptive energy-based initialisation leading to the joint paper Superpixels Optimized by Color and Shape. Year 4 student Jeremy Forsythe has completed in 2016 the excellent project Convex Constrained Meshes: a new method to generate resolution-independent superpixels leading to the joint paper with Microsoft, see the journal version. The projects of Mr Caspar De Haes (Map Colouring), Mr Chris Palmer (Topological Robotics) were ranked the 2nd and 4th best year 4 projects in the department in 2011. Mr Chris Walker: Topological Complexity of Configuration Spaces (2011, year 4). Ms Camilla Banks (2009, year 3). 5 April 2019. Ana Garcia. Potential solutions to mathematical challenges for crystalssolid crystalline materials. 29 March 2019. Linear algebra exercises by Katerina, Marco, Thomas, Cameron, Krasen, Phil. 22 March 2019. Ana Garcia. Matrix representations of linear maps, a linear independence. 15 March 2019. Ana Garcia. Equivalence relations, vector spaces and linear transformations. 8 March 2019. Milo Torda. Algorithmic computation of homology groups for 2-dimensional complexes. 1 March 2019. Algorithmic computation of 1D homology by Katerina, Marco, Cameron, Thomas, Milo. 22 February 2019. Algorithmic computation of 0D homology by Katerina, Marco, Cameron, Thomas, Milo. 15 February 2019. Phil Smith. (Continued) Introduction to homology with examples for graphs. 8 February 2019. Cameron Hargreaves. Persistent Homology and its applications with the Ripser software. 1 February 2019. Marco Mosca. Reduced cell theory and the instability of Niggli's reduced cell. 25 January 2019. Ana Garcia. Definitions and examples of simplicial complexes and homology groups. 18 January 2019. Grzegorz Muszynski. Support Vector Machine and t-Distributed Stochastic Neighbor Embedding. 11 January 2019. Grzegorz Muszynski. Topological & Machine Learning Pattern Detection Methods in Climate Data. 14 December 2018. Phil Smith. Skeletonisation algorithms for unstructured point clouds with theoretical guarantees. 7 December 2018. Yury Elkin. Dual-tree algorithms and applications to data skeletonization. 30 November 2018. Fraser Holloway. A classification of pulse shapes from AGATA. 23 November 2018. Miloslav Torda. Optimal lattice packings in Euclidean spaces. 16 November 2018. Ana Garcia. Homotopy equivalence and simplicial complexes. 9 November 2018. Katerina Vriza. Symmetry groups of crystals in dimensions 2 and 3. 2 November 2018. Arshad Siddiqui. Polygonal vortex meshes in microscopic images. 26 October 2018. Cameron Hargreaves. Crystal lattices and notations for space groups. 19 October 2018. Thomas Welsch. Helping a robot to see a correctly placed piece of cloth. 12 October 2018. Krasen Samardzhiev. A Python-based tutorial on alpha-complexes. 5 October 2018. Krasen Samardzhiev. A Python-based tutorial on Delaunay triangulations. 28 September 2018. Marco Mosca. Voronoi diagrams and Delaunay triangulations. 24 September 2018. Ana Garcia. Combinatorial and topological graphs and their invariants. 14 June 2018. Krasen Samardzhiev. A Python-based tutorial on Topological Data Analysis. 31 May 2018. Grzegorz Muszynski. Diffusion maps for dimensionality reduction with examples. 24 May 2018. Grzegorz Muszynski. Periodic behaviour in low-dimensional representations of climate data. 10 May 2018. Krasen Samardzhiev. 1D persistent homology of census data in the US. 3 May 2018. Phil Smith. Reeb graphs and alpha-Reeb graphs for data skeletonisation. 26 April 2018. Phil Smith. Duality between persistent homology in dimensions 0 and 1 for 2D clouds. 12 April 2018. Krasen Samardzhiev. Persistent homology of alpha-complexes for 2D clouds. 22 March 2018. Krasen Samardzhiev. Homology groups: matrix computations. 15 March 2018. Krasen Samardzhiev. Homology groups: manual computations. 8 March 2018. Yury Elkin. Data skeletonisation algorithms for unorganised point clouds. 22 February 2018. Naohiko Ban. Reconstruction of a vortex structure from 2D sequential images. 15 February 2018. Eris Tricker. Converting pixel-based skeletons into planar graphs. 8 February 2018. Asim Munshi. Thinning algorithms for black-and-white images. 25 January 2018. Grzegorz Muszynski. A topological detection of Atmospheric Rivers. 18 January 2018. Krasen Samardzhiev. Kuratowski's criterion for planar graphs. 11 January 2018. Yury Elkin. Straightening algorithms for polygonal curves. 20 December 2017. Yury Elkin. Skeletons of 3D clouds from micelles. 14 December 2017. Fraser Holloway. Pulse shapes from AGATA. 7 December 2017. Graham Briggs. Periodic crystal structures. 30 November 2017. Phil Smith. Simplest polygonal surfaces. 23 November 2017. Yury Elkin. The Euler characteristic. 16 November 2017. Krasen Samardzhiev. The union-find algorithm. 9 November 2017. Krasen Samardzhiev. Clustering algorithms for point clouds. 2 November 2017. Phil Smith. Topological equivalences of graphs. 17 October 2017. Phil Smith. Combinatorial graphs. LaTeX Wikibook, LaTeX tutorials by Andrew Roberts. Graphics program: Inkscape available for free. Free tutorials on HTML by W3Schools. Free tutorials on Java by Oracle.